Why Is The Mystery Of The Somerton Man So Appealing? Humans have a naturally inquisitive disposition. We like to question, we like to share information, and we often say that knowledge is power. If that is true, then perhaps the lack of knowledge is weakness. In the case of mystery, it shows. Anything that occurs out of the ordinary tends to attract more attention, even when a closer look might reveal that the details aren’t as odd as they seem–but the Somerton Man mystery might be right on the money. It is just as weird as it looks. There are many details of the case that cause our curiosity to flare. When the rest of the book from which the page was torn was finally found, police noticed a phone number, numbers, and a possibly encrypted text inside. Since it was found, authorities have never been able to discover the meaning behind the text or numbers. The phone number belonged to a woman who went by the name of Jessica Thomson (an alias, as she was born with the name Jessie Harkness). The woman denied all knowledge of the Somerton Man. In the most recent interviews conducted with Thomson, it was suggested that she seemed uncomfortable when answering questions (although after so many years of people questioning her about the same subject, that’s probably not a huge surprise). Thomson’s daughter eventually revealed that she believed her mother did indeed know the John Doe. Just these odd circumstances were already enough to elicit fears that the John Doe could have been the victim of international Cold War paranoia that was escalating around the same time period. The corpse was never identified, was associated with an encrypted code, and the man died under questionable circumstances. Was he poisoned? Some people seem to think he was. Even the United States Federal Bureau of Investigation scanned their databases for fingerprint matches. The FBI discovered nothing (that they made available to the public, anyway). Dental records showed nothing either. There were several witnesses who may have seen the man at the same part of the beach where his body was later discovered, in various stages of movement. Some believed he may have been drunk, and so they decided not to lend the possibly dying man any help. In 1959, someone else claimed that they had seen one man carrying another along the same beach. A report was made, but the credibility was probably questioned immediately. The coroner in charge of the man’s autopsy deduced that the likely cause of death was an undetectable poison. Other than that, the corpse belonged to a man who was in perfect physical shape. 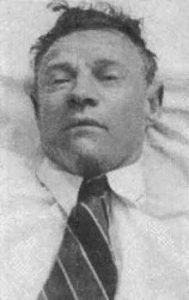 Most theories about the Somerton Man’s death involve espionage. As with most mysteries that have persisted so many decades, though, we will probably never discover the truth as to who the man was or how he really died. Even today, military agencies and hobbyists around the world struggle to understand the numbered code written in the book of poetry. Is it real? That’s another question to which we’ll probably never find the answer.